Okay– so maybe this is actually a cowl. I’m not really sure what the parameters of a cowl versus an infinity scarf are, so if anyone has any input, I welcome it! All I know is this scarf is ellipse-shaped and you twist it around twice to wear it. I used Mango Moon Dharma, which is Nepalese silk fabric ripped up, recycled, and respun into beautiful handknitting yarn. 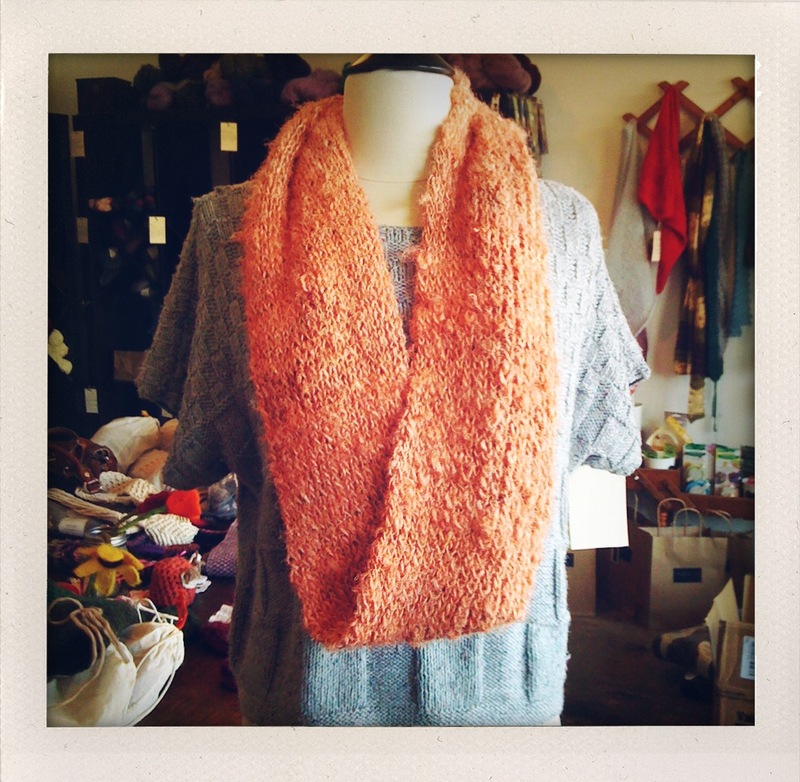 It’s super soft and drapey (softer than you think!) and almost has an angora-like haze to it. The rib stitch in this pattern uses a twisted knit stitch, which makes the rib a bit more poppy and three-dimensional. Thanks to customer Janna Whistler for inspiring me to make this! It also comes out beautifully in Cascade Baby Alpaca Chunky. Cast on 60 sts. Work a K1tbl, P1 rib, making sure to knit all the stitches into the back loop (that’s what “tbl” means!). This causes the knit stitch to twist. Repeat this row until you finish both balls. Cast off, and sew one end of your rectangle to the other. Simple! Please do not hesitate to stop by the shop if you’re in LA or shoot us an email if you need clarification. Nice simple pattern! I love the sweater underneath the scarf too. The knit shirt underneath is from a Rowan Magazine– I believe the one from this last Summer. I love it, too! I knit it out of Kraemer Tatamy Tweed DK. Also, if you decide to make it with the Cascade Baby Alpaca Chunky, I used 3 skeins and cast on 50 instead of 60. It’s SO COZY! Love this pattern. The Dharma is gorgeous and feels fantastic on. 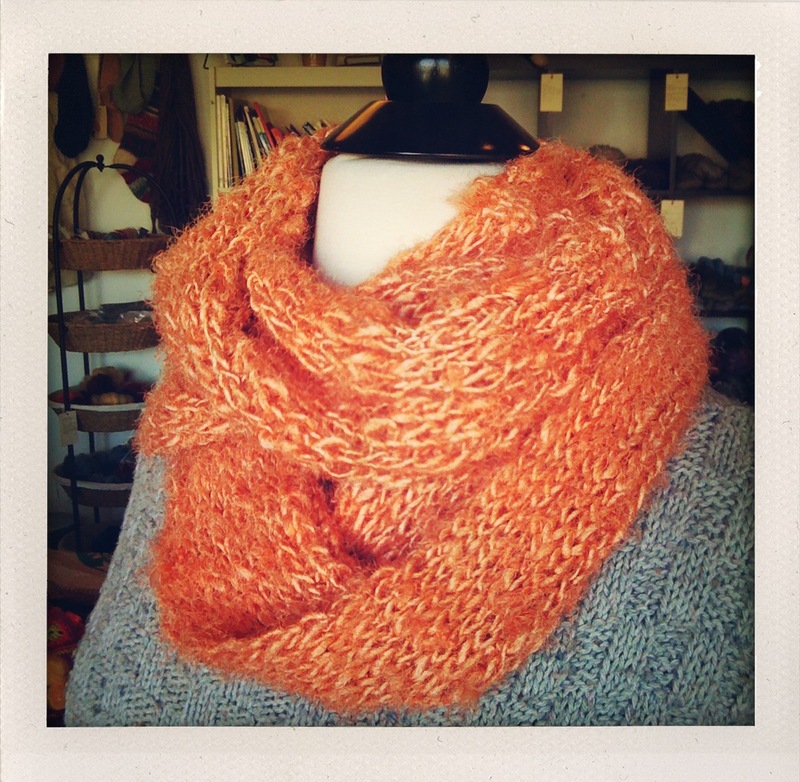 What would you think of doing this with Di Ve Autunno yarn? I was looking on the site for the pattern for the basketweave cowl that you had in the store (in the forest color) and can’t find it, but think maybe this would be a good project (and work up more quickly)…Thanks! Yeah– it would be beautiful with Autunno. 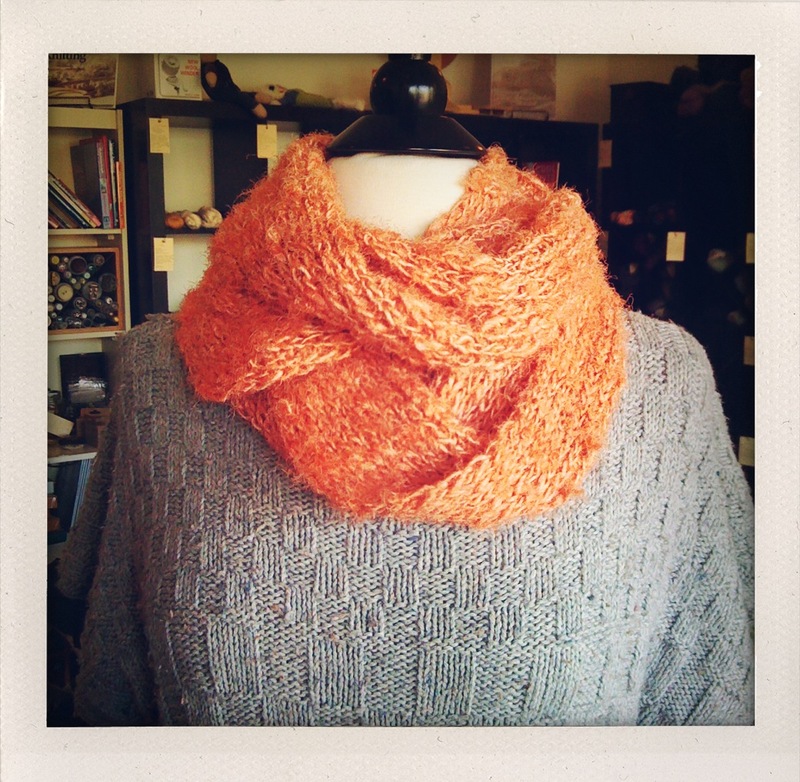 The pattern you’re looking for is here on the blog and it’s called the Moss Stitch Cowl. Sadly, Autunno is discontinued!!! I loved that yarn! I hope it comes back.